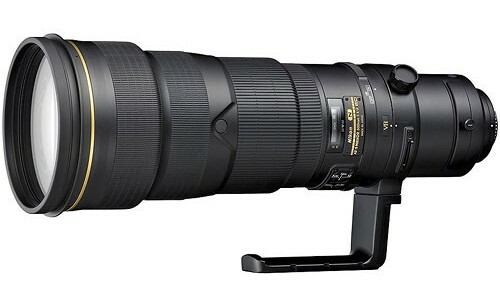 This is the legendary f/4 500mm super telephoto lens from Nikon with their Vibration Reduction technology. This is a true ornithologists’ dream come true. Use it with the TC-20EIII (with manual focusing only) and you have a combination that extends to a monstrosity of 1000mm. needless to say a lens of such huge range will be heavy but Nikon has managed to keep the weight down to only 3.88 kilos making it comparatively light. A lens of this magnitude must have some sort of optical stabilization and Nikon has answered the call with its second generation Vibration Reduction technology. What you get is the equivalent of a full four stops slower shutter speed than normal. Several other features of the lens include the presence of Nano Crystals, three Extra-Low Dispersion elements and Super Integrated Coating (SIC) to ensure the suppression of flares, ghosts and color fringing. 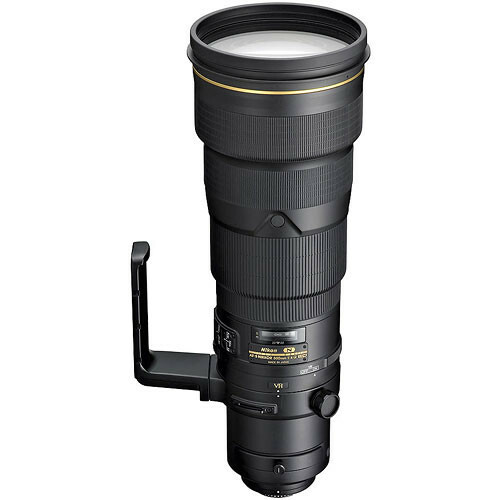 Silent Wave Motor ensures that the AF-S NIKKOR 500mm f/4G ED VR during auto-focusing which is imperative unless you want to scare the subjects you’re trying to capture. Another wonderful piece of technology is Nikon’s M/A which ensures the easy transition from auto-focusing to manual focusing just by a simple turn of the focusing ring. Diameter x length(extension from lens mount) Approx. 139.5 x 391 mm/5.5 x 15.4 in. Weight Approx. 3,880 g/8.6 lb.